China is the mirror in which the West looks for reassurance she is beautiful. This one means a lot to me. I studied Chinese for the better part of a decade, first as an undergraduate at Oxford and then for an MA and PhD at Berkeley, and spent nearly two years on and off in China itself. There’s probably not a culture and people I have more respect for, even if in many ways I don’t actually like it! That’s what knowledge does—it allows you to get beyond superficial preferences of like/don’t like and get to know something on its own terms. And that’s why our general attitude to China drives me mental. The West has always wreathed China in stereotypes of inscrutability, ‘exoticism’, unknowable mystery. Maybe it’s the impermeable language, the antiquity of the culture, the vast size of the population—or maybe we just want a lazy shorthand for ‘the opposite of us’. Chinese economic demand was the only thing that bailed out our hapless failed elites after the 2008 banking crisis, our universities are flooded with Chinese students, our cities with Chinese investors—and yet China remains the country we stubbornly refuse to understand. The first series of Sherlock featured a Chinese storyline with a mysterious exotic woman in a silk dress, and a ninja. In the twenty-first century. Perhaps the best-known play ‘about’ China, in which China actually serves mainly as a backdrop for a white man’s voyage of self-discovery (a hugely indulgent bourgeois trope of “let’s make the story about us!” which dominates white plays about Africa too) was marketed on the basis that the writer had never been to China, as if it was somehow advantageous not to know the people you’re writing about. When we’re not doing the mysterious East, we’re doing the oppressive East. There’s been a flood of books in recent years about the disasters of the Mao years, some like Frank Dikötter’s in response to new documents released from the archives, others like Jung Chang’s poorly written and clumsy propaganda. But they all serve a certain purpose: to call attention to the evils of Maoism. Why, when the world is not exactly drowning in Maoists, are they doing this? The lesson of the twentieth century is that concentrated power, whether in the hands of communists, fascists or bankers, is lethal. As a writer, you know full well what the powers that be want to see, what you’ll get paid and lauded for, and what will challenge orthodoxy and you’ll find hard to get accepted. That’s the basic test of any writer’s integrity—do you go with or against the grain? It’s impossible for me to respect any writer who goes with convention, who serves power, no matter how well crafted their work might be. Poster Artwork for The Sugar-Coated Bullets of the Bourgeoisie. And what the powers that be in both China and the West (who thanks to the unbelievable stupidity of Gideon Osborne are increasingly one and the same) want to hear is that Mao was a murderous dictator, the Chinese revolution was top down totalitarianism, any grassroots revolution inevitably ends up in mass bloodshed. Global elites want to hear this because they are terrified of the possibilities of mass action, and even more terrified of ordinary people believing in those possibilities, and they will do anything from mass surveillance to state violence to the rewriting of history to make people believe grassroots collective action is doomed to end in disaster. I don’t care about Mao or his reputation. The lesson of the twentieth century is that concentrated power, whether in the hands of communists, fascists or bankers, is lethal. The twenty-first century will be about the decentralising of power, not its concentration. What I am interested in is telling the truth and restoring agency to real people. The Chinese revolution is probably the greatest grassroots, bottom-up revolution in modern history. Mao did not make it; it made Mao and the other Communist Party leaders, who struggled to harness its momentum and codify it into orthodox party structures. It was an extraordinary efflorescence of popular agency, as scepticism turned to hope turned to fervour and belief and action. It transformed the lives of hundreds of millions of people. It also led to enormous tragedy. The famine that followed the Great Leap Forward didn’t come about because of some heartless autocrat in an ivory tower; it came about because people had seen their lives transformed by ten years of their own actions and wanted to push those actions further, to change the world again and again. And they pushed too far, driven and harassed by authority. And they, not authority, were the ones who paid for it. Modern China, with its rampant individualism, consumption and cruelty, might seem to have little in common with that idealism, but it does. 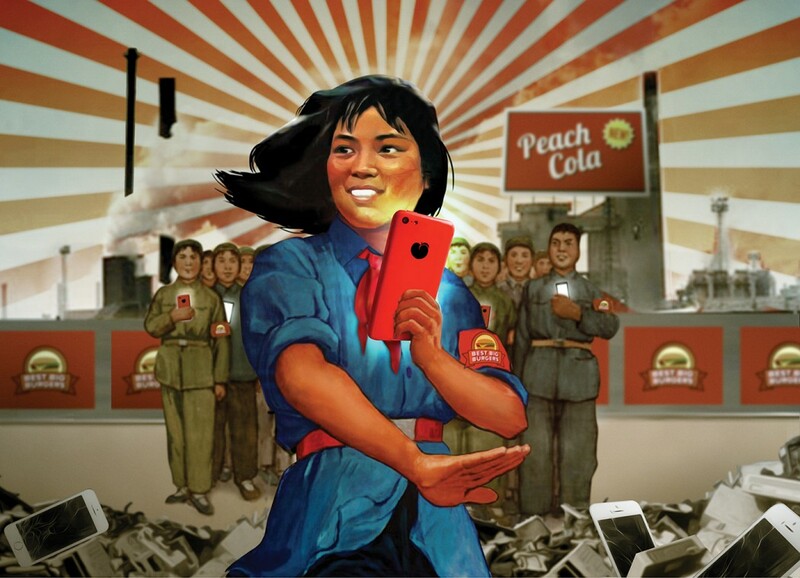 For one thing, it’s the culmination of the Communist Party’s betrayal of the movement that created it—a betrayal that was already apparent in the Fifties but is at its apogee now, with rampant corruption and a creeping totalitarianism under Xi Jinping. The question now, as the global economy reels from China’s shrinking demand and China’s rich ship their money overseas as fast as possible, is what happens when that dynamism and hope dies for capitalism, the way it did for Maoism? Find out more about Anders' new play The Sugar-Coated Bullets of the Bourgeoisie.